Promoting early child development – Ready Steady Riders are passionate about promoting all areas of early child development. We have found that Strider sessions not only promote physical skills but following instructions and having a shared interest to discuss helps children to develop their speech, language, and communication skills. The community around our sport and its competetive element help to promote positive personal, social and emotional development. When we first discovered Little Racer Books on Instagram (https://www.instagram.com/lilracerbooks/) we were so excited to engage our riders in literacy too, with a story they could really relate to. A book about Strider racing! 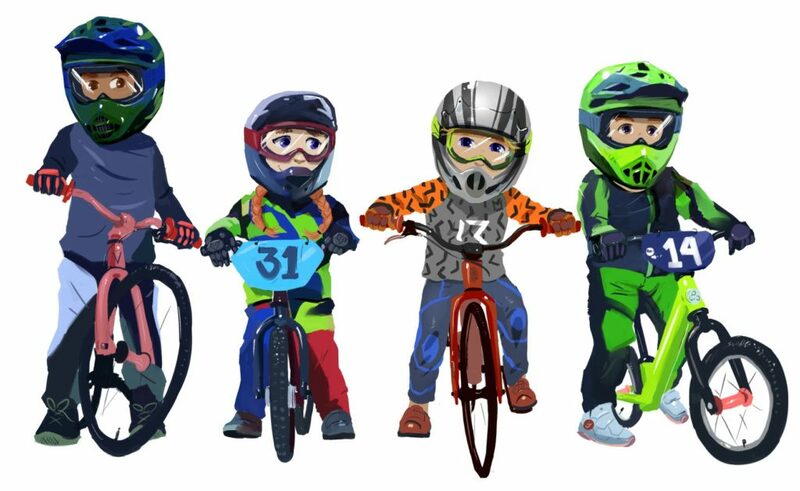 Little Racer Books – We hurried to order the first book in the series “My 1st BMX race” (available on Amazon). When it arrived we were not disapointed. Never before have we found a story we could relate to so heavily. A short and sweet story about a Strider riders first race experience with the coolest illustrtions. Of course we had to share it with our riders, who loved and embraced it. “Can we have a story at the end?” soon became the most commonly asked question at our sessions. Progressive reading – “My Next BMX Race” was released not long after. We were impressed by the way this story linked so well to the first and the reading level had increased to grow with the very riders it was written for. Again it was a huge hit with our riders. I felt I had to reach out to the author and thank her for inspiring our riders through literacy. Making friends – Much to my surprise author Brittny Love responded to my correspondence and expressed an interest in visiting our sessions and reading to our riders! Needless to say we were thrilled to welcome her and her son, the main character and inspiration for the books Sirian to the UK, just before the Strider cup at Birmingham last September. We had the best time. Brittny read to our riders at Unit3Sixty skate park, and at our Birmingham track. It was so exciting to ride with the character from our favourite books, and Brittny’s story telling helped us to prepare riders old and new to race. Inspired – On returning to the USA Brittny began writting the 3rd book in the series “My BIG BMX Race” inspired by her travels with Sirian to the Strider world cup in Colorado, and their adventures with us in the UK. Edward required some images on which to base his illustrations and so Sirian headed to his local track in the mountains with pro BMXer Chris Sutton for some practice on his pedals. Daunted by the experience Sirian was reluctant to ride. “What would Rhianon do?” Brittny asked him. “She’d ride” Sirian replied. Drawing on the strength of his new Ready Steady Rider friend back in the UK Sirian found the courage to get on and ride. Sirian found his confidence and had a great day! It’s precisely this camaraderie that make the Strider community and these books so magical.